The Case Building is perfectly located near many of Dallas’s best recreation, entertainment, and shopping venues. Imagine being within walking distance to local shops, art galleries, night clubs and restaurants, making everything from afternoon shopping to lunch with friends easily within reach. Deep Ellum’s Bark Park is close by and ready to take care of you and all the furry members of your family. Shops like The Trunk Club, or the Deep Ellum outdoor market and more are just a quick step away. Downtown Dallas, Fair Park, and other afternoon adventures are also at mere minutes, as we are within walking distance from DART Bus and Rail Line, with convenient access to the 75-highway, I-45, and I-30. When you live in The Case Building, you are within walking distance to a plethora of entertainment and restaurants. 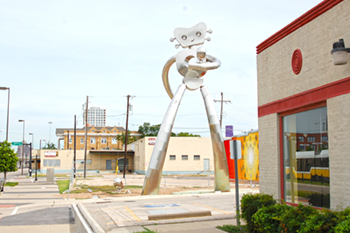 Deep Ellum is home to creative public art, murals and art galleries, such as the fantastic Traveling Man sculptures found throughout the neighborhood. 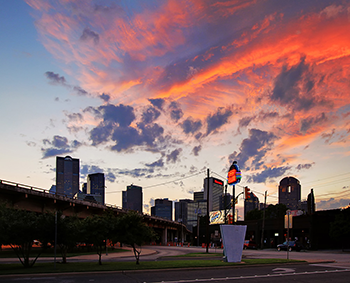 Deep Ellum hosts the Deep Ellum Arts Festival, which transforms six blocks of the neighborhood into one incredible street festival. Live Music within Walking Distance. 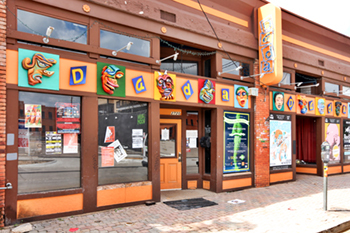 Deep Ellum thrives on their eclectic blend of art galleries, music venues, bistros, craft beers and bars - such as Deep Ellum Brewing Company - and destination nightlife scenes like Hide Bar, Black Swan Saloon, and the famous Club Dada. The fun and entertaining music venues, like The Bomb Factory, Trees and The Door, always bring the best Indie bands to town. 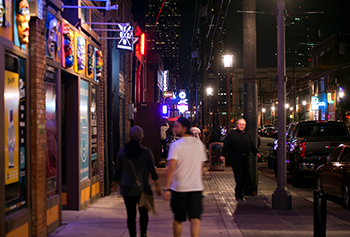 The Deep Ellum neighborhood never fails to hit the spot when it comes to your culinary cravings. With a variety of eateries ranging from upscale to adventurous, within walking distance from your new home. Indulge in your All-American favorites from Uncle Uber's Sammich Shop, thin crust pizzas from Cane Rosso, Cajun favorites from The Free Man Cajun Cafe or have breakfast at any time of the night at Buzzbrews and Cafe Brazil. For more international flavors, there's the fresh authentic Mexican fare at Maracas Cocina Mexicana and the always satisfying sushi bar, Deep Sushi. The neighborhood is also home to the several vintage boutique stores. You can have it all just blocks away from your new home! World Famous Neighborhood with Friendly Neighbors. There are several opportunities to meet your neighbors and create new friendships for you and your furry friends can too at places like Deep Ellum's dog park, Bark Park Central. Get involved wth neighborhood projects, like the Deep Ellum Urban Gardens. This closenit neighborhood community has great community organizations working together to make neighborhood improvements. Visit the Deep Ellum Texas Community Page to find out how you can get involved as well as find more information about the ongoing community projects that you may be interested in.